Like any homegrown fruit or vegetable, herbs are at their best when they are freshly picked from the garden. Growing your own herbs not only gives you a sense of fulfillment but also, more important, helps you reduce food cost. But when you have too many herbs on hand and just want to save them for later, what are the ways to keep them from spoiling too quickly? Read on and learn how selecting the right herb to plant, storing techniques, and cooking options can help you avoid wasting herbs. There are several herbs available, each with their own distinct aroma, use, and characteristics. And one way to keep them from going bad is to use them frequently for cooking or food preparation. 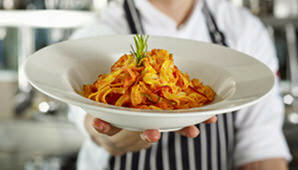 Do you love cooking Italian dishes? How about making homemade sausages? When starting a mini garden, choose the herbs with flavours you like the most and will most likely be used often in your kitchen. And if you are interested to know more about planting herbs, check out and join our Plant, Grow, Eat: An Urban Gardening Starter workshop! Here are some of our recommended herbs that you can try growing at home. Basil is a popular herb because of its cooking versatility. Other than being a staple for making pesto, basil is perfect for your tomato and Mediterranean dishes. Its flavour intensifies when cooked, so it is better used raw or added at the last minute. Basil grows easily in pots, too. Try placing a pot of basil on a sunny windowsill of your kitchen. Aside from giving your room a fresh aroma, its fragrant leaves can also shoo flies away. Perennial chives are more than just garnishes on top of your appetisers. They have a distinct onion-like flavour, making them a great addition to your garden if you love having salads, dips, salsas, and clear soups at home. They produce these charming and edible pink flowers, too. If you do not have enough garden space to plant chives, try growing them in mason jar planters and have a pretty herb display indoors. Coriander, or cilantro, is a great plant to have at home as you can eat its leaves and stem or grind its seeds to spice up your dishes. If you are a fan of Asian flavours, its citrus-like flavour is a perfect accompaniment. Coriander plants grow well in pots and love warm, sunny places. 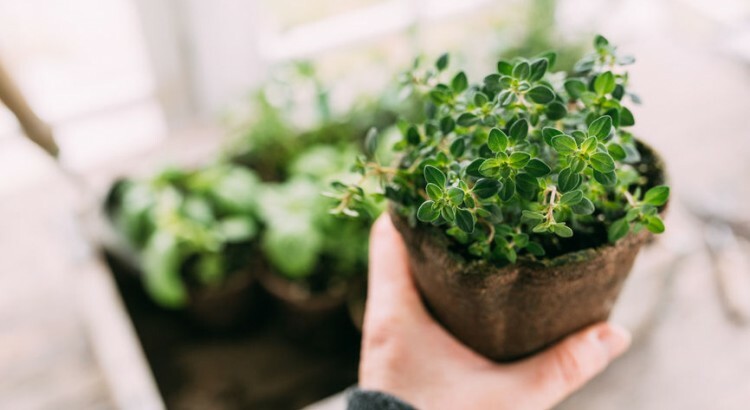 Try trimming your potted coriander regularly to encourage leaves to sprout. The feathery leaves of the dill plant may look delicate but a few flavour-packed sprigs are all you need to season your seafood, butters, oils, dips, and marinades. Dill plants grow best in full sun and can grow up to a metre high, so you will have to trim it a few times. Also, try to plant them in a fixed position as dill plants do not like to be moved a lot. Having a potted mint at home is a good idea if you love sipping tea. Ripped or chopped up mint leaves are also great in vegetable or fruit salads. Like other common herbs, mint thrives well in pots as well as in moist, shady places. There are several varieties of mint but the most popular are spearmint and peppermint. But you can try growing flavoured mint plants, too. Did you know that there is a mint plant that smells like chocolate and pairs perfectly with ice cream and berry desserts? The dark green and slightly hairy oregano leaves have a sweet, spicy flavour that can give a lift to your Mediterranean dishes, pizzas, and pasta. They also add great flavours to several basic home ingredients like fish, meat, beans, tomatoes, eggplant, and zucchini. Oregano loves moist soil conditions plus a great view of the sun, making your balcony space the perfect spot. Gone are the days when parsley was only known as a pretty garnish on the plate. Aside from its flavourful leaves that are good for creating homemade sauces, parsley has also been identified as a nutritious herb—a good source of antioxidants, folic acid, and vitamin C. The most popular varieties of parsley are flat-leaf and curly. While flat-leaf parsley has a stronger flavour than the curly variety, both favour rich, well-drained garden soil as well as sunny or partially shaded spots. Classified as a frost-hardy herb, rosemary thrives in both good and dry types of soil. Its woody stems and needle-like leaves can grow well in pots together with the full sun. A quintessential ingredient of Mediterranean cuisine, aromatic rosemary sprigs are great in casseroles, infusing oils and vinegars, or as barbecue skewers. Chopped rosemary leaves also works as a good flavour enhancer to bread, potatoes, vegetables, rice, lamb, and fish. Sage not only produces lovely elongated leaves but also complements pork dishes, soups, and stuffings. Its flowers are also great for making summer teas. Because of its strong flavour, it is best added in small amounts or at the end of cooking. For best growing results, place your potted sage in a sunny area and water it sparingly. The lemony scent and flavour of thyme makes it a popular herb for cooking. Tie a bunch of fresh thyme with twine and use it as a bouquet garni to flavour your soups, stocks, and sauces. It works exceptionally well with chicken, pork, fish, and vegetables. A potted thyme grows best in well-drained sandy soil and does not need a lot of water. To keep your harvested herbs fresh longer or ready for cooking, here are a few simple tips you can do at home. Procedure: Use a water-filled jug to hold your fresh herbs a few hours before use. Suitable herbs: Do this for delicate herbs like tarragon, parsley, mint, oregano, and coriander. Procedure: Chop your herbs ahead of time, place them in small dishes (like ramekins or mugs), cover them in damp paper towels, then store for a few days in the fridge. Suitable herbs: Great method to use when you need a lot of pre-chopped chives, mint, or basil for cooking. Procedure: Prepare a damp paper towel then use it to wrap the stems of your whole herbs; slip your wrapped herbs in a covered jar or resealable bags then refrigerate for up to a week. Suitable herbs: Try this procedure after rinsing and drying your fresh basil, flat-leaf parsley, chives, and tarragon. Procedure: Use a food processor to chop your herbs then add enough olive oil while processing (about 1 tbsp of oil per 3 tbsp of herbs); portion your herb mixture then spoon them in small resealable bags, label each, then store in the freezer for up to 4 months. Suitable herbs: Freeze herbs singly or combined with garlic like basil, parsley, thyme, and oregano. Air circulates around herbs more easily when they are hung to dry. Procedure: Fill an ice cube tray to the brim with finely chopped herbs, then cover the tray with enough water before placing it in the freezer; once frozen solid, pop them out of the mould, transfer into a resealable bag, label, then keep it in the freezer for up to six months (alternatively, you can also do the same steps when making edible flower ice cubes). Suitable herbs: Turn chopped chives, parsley, tarragon, dill, and coriander into frozen cubes that you add directly into hot liquids like soups, sauces, and slow-cooked dishes. Procedure: Line a wooden frame with a piece of cheesecloth then lay individual leaves, fronds, or small sprigs to dry; make sure to place your frame in a dry, airy room without direct sunlight. Once dry (after at least two weeks), pack your dried herbs loosely in airtight glass jars and use them within four to six months. Suitable herbs: Try doing this drying process for herbs with large leaves like bay. Procedure: Use a kitchen twine to bind three to four stems together, then fix each bundle to a line in a dry, airy room without direct sunlight. Once dry (after at least two weeks), pack your dried herbs loosely in airtight glass jars and use them within four to six months. Try not to tie more than one type of herb together as herbs vary in drying times. Suitable herbs: Do this technique for herbs with tough leaves and woody stems like rosemary and thyme. You may also want to read more tips on drying herbs shared by leading Aussie herbalist Reece Carter from this article. Probably the best way to avoid wasting your herbs is by adding them to your home-cooked meals. With these great suggestions to try, you will never run out of recipe ideas with herbs. Marinades are typically comprised of an acid or alcohol component to tenderise the meat plus an array of ingredients for adding flavour. When using herbs to infuse flavours into your marinades, you can be generous and use a lot for a more flavourful infusion. A combination of citrus juice with basil is great when making marinades for pork. You can also try marinating your venison or beef in red wine plus bay, lovage, and juniper. Rosemary oil can level up your poultry dishes and can make anyone happy when given as a gift. A bottle of good quality oil or vinegar is made even better when flavoured with herbs. Rosemary oil, made by adding sprigs of rosemary and garlic cloves to olive oil, is a popular herbed oil that taste wonderful with chicken and fish. On the other hand, tarragon vinegar, which is great when making dressings, is done by adding tarragon sprigs, peppercorns, and garlic clove to white wine or cider vinegar. Herbs are perfect for livening up a simple bowl of mix of veggies or sauce for dipping like salsa. Pesto, on the other hand, is a classic favourite for adding colour and flavour to your plate of pasta. And versatile accompaniments like aioli, chimichurri, and yogurt sauce pair with just about any main dish, salad, or bread. Start your meal with fresh flavours by mixing herbs into your soups. Try to bring out the flavours of your dried herbs by adding them during the cooking process then finish it off with freshly chopped ones. This way, every tasty spoonful is aromatic, too. A simple bowl of creamy tomato soup is made even better with chopped fresh basil. Herbs in desserts? Certain herbs like basil and mint work well in counteracting the richness of some custards and syrups. Try not to use too much though as herbs can easily overpower the flavour of some treats. For every cup of tea you want to make, prepare 2 tablespoons of finely chopped herb of your choice and 1 tablespoon of dried herb. For a stronger tea, you can adjust the amount of herbs per cup of drink. Place the herbs in a teapot. Fill a pot with enough water then bring it to a boil. As soon as the water starts boiling, pour the hot water into your teapot with herbs. Let the herbs steep for about 5 minutes. Place a tea strainer onto your cup and pour your freshly made herbal tea. Flavour your cup of tea with sugar, honey, or lemon juice. Enjoy! Bread and herbs make a perfect match. While you can knead in chopped herbs into your dough for flavour, sprinkling them on top is just as delightful. Famous bread recipes include the Middle Eastern manakeesh with thyme as well as the Italian’s focaccia with rosemary. Baking these will surely fill your entire home with a delightful yeast and herb aroma! Put your fresh herbs to good use and practice good storage techniques to avoid wastes. Herbs may be just tiny leaves growing in your garden but they do pack mean flavours that could make a difference to any home-cooked dish. They are versatile and even lets you season your meals without the addition of too much salt. So next time you harvest a bunch of fresh rosemary from your garden or even buy a pack of parsley from the grocery, think of the best storage method or recipe that will make the most of every flavourful leaf!